I absolutely LOVE sushi. I guess being brought up in Japan does have something to do with that. Japanese food is definitely an acquired taste. However, in recent years the growing exposure to different cuisines has played a huge role in people experimenting with different flavours. Japanese food is now everywhere. Being vegetarian, the variety of sushi is limited in restaurants. 😦 Anyways, when you have a creative mind and hands that are willing to get dirty (dirty with food is always ok, not with mud. There’s a difference! I’m not an outdoor-hiking-kind fyi) then there’s no limit! Having a love for aesthetics, the food I eat has to look as good as it tastes. The taste is always takes precedence though, I will never compromise on taste. Saying that, I would compromise on it just if it is very unhealthy and I’ve just come back from cardio. The cliche aphorism works well for me – health is wealth. Please stare at it in awe as I did. My husband thought it was very professional! And I got tons of likes on Facebook and Instagram which boosted my ego. Small things make me happy. Happiness then leads to big things 🙂 So try being happy with small things in life, don’t just wait for the big things as they might not come and you’ll end up being a grumpy-old lady by then! I’ve met many, and boy are they unpleasant. 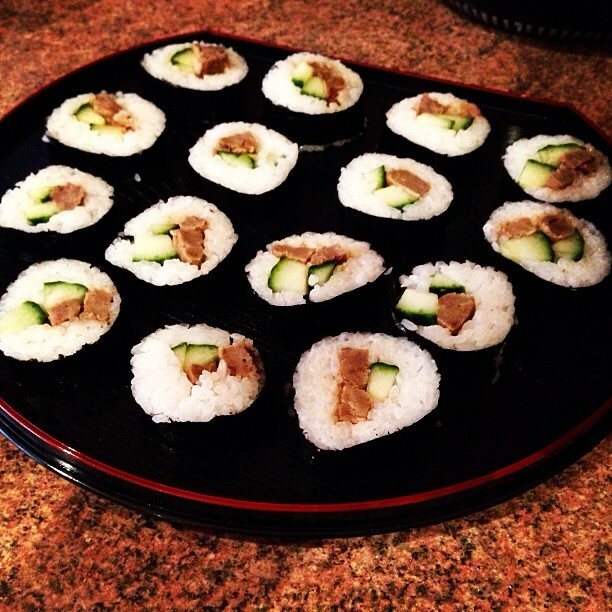 Back to Sushi – just went slightly off tangent there. Cook rice in a rice cooker. Japanese rice takes less water than normal rice, so be sure to check the instructions. The ratio of the rice I use is 1 cup rice to 1 1/3 cup water. Let the rice cool down, don’t refrigerate it. In the meantime, pour a bit of teriyaki sauce in a pan and cook steak strips. Add water as needed, but make sure the end result is sticky steak and not watery. Add seasoning to the rice. If you like it more on the sour side, add more. Oil Sushezi a bit before putting the rice inside, and follow instructions. See the video- that’s what I did as this was my first attempt! Put cucumber on one side of your rice mixture, and the Quorn Strips on the other. Place glossy side of Nori downwards, and you’re ready to roll. Use water as a glue for the end of the Nori. Refrigerate the roll for a while, then cut the sushi. And put the cut pieces back in the fridge. Sushi is best served cold with Japanese ginger and Wasabi. Note: Hands might get sticky with rice. Keep bowl of water nearby and dip your hands in often to remove stickiness.To remove stickiness of knife when cutting sushi, I like dipping knife in water after each cut. Keeps the sushi clean and pretty! Enjoy! Itadakimasu (いただきます)! Have I mentioned I speak/read/write Japanese? Ok so I do. Not as well as before though, as I don’t have much practice anymore!